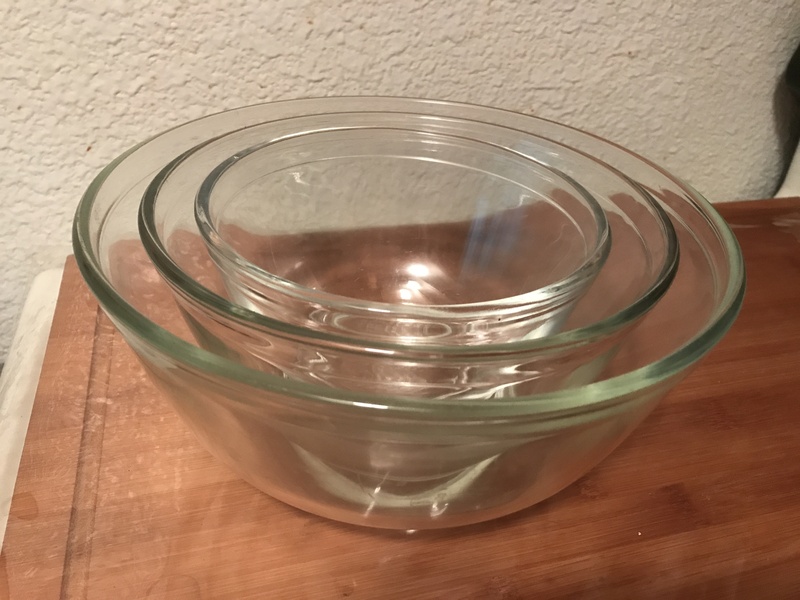 I found these 400 series mixing bowls in clear. I didn't even know they came like that! I like them. I think they are from the 70's or 80's but I am having a very hard time finding anything on them. Anyone have any info? These are tough to pin down. I have access to many catalogs and other literature, but haven't found anything among them yet. The only ones I've seen have metric capacity and microwave on them, so that would be mid-1970s at the earliest. Doug D. wrote: These are tough to pin down. I have access to many catalogs and other literature, but haven't found anything among them yet. The only ones I've seen have metric capacity and microwave on them, so that would be mid-1970s at the earliest. Thanks Doug. I was going to guess 80's but it was just a guess. These are elusive information-wise. These are also seen marked 740x and with both imperial and metric capacities. At some point, the plain clear 7400s were changed to a fluted/ribbed design. Edit: I did some more digging, and it appears they are from late 1980s, with the switch to the "sculptured" design in the early 1990s. Perhaps the 400 marked ones are earlier(?). Edit: More digging. They appear to have debuted in 1987 with plastic covers as part of the Storage Plus Storage System. They do not appear in 1986 catalogs. 7401, 7402, and 7403 were cataloged as 3, 6, and 10 cup "all purpose bowls", which translates to 1-1/2 pt, 1-1/2 qt, and 2-1/2 qt. Also sold as a #7252 set of three. They may have been 740x in the catalogs, but still 40x on the bowls for some period of time. The 7 on the backstamps often appears "tacked on". The non-sculptured 400 shape disappears after the 1989 catalog. The sculptured version first appears in 1992 catalogs. I chalk my lack of awareness of these up to: 1. They're clear. 2. 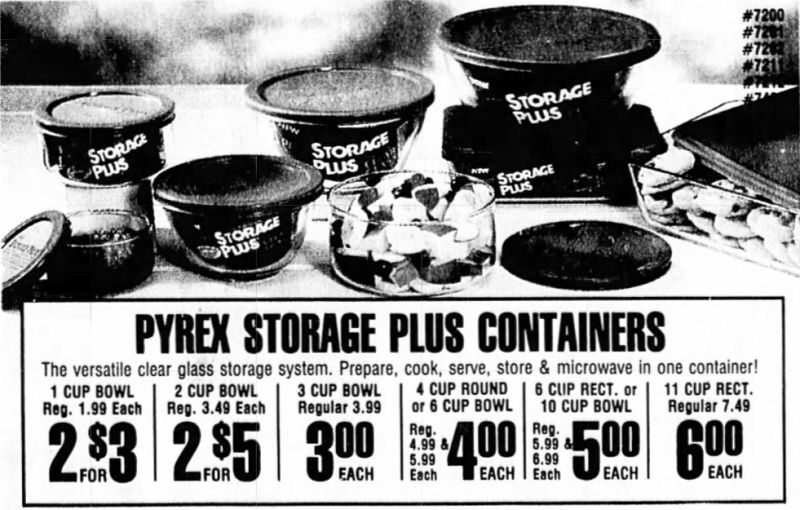 They're after 1986, when decorated opal Pyrex was discontinued. Of course, now I need to get some. Doug D. wrote: More digging. They appear to have debuted in 1987 with plastic covers as part of the Storage Plus Storage System. They do not appear in 1986 catalogs. 7401, 7402, and 7403 were cataloged as 3, 6, and 10 cup "all purpose bowls", which translates to 1-1/2 pt, 1-1/2 qt, and 2-1/2 qt. Also sold as a #7252 set of three. They're after 1986, when decorated opal Pyrex was discontinued. Of course, now I need to get some. Wow! Thanks for the dedication Doug! I do love my decorated opal ones but these have a happy home among them. Since the mold is the same they just fit right in.